News feeds were flooded today with images of flames billowing out of the beloved Notre-Dame cathedral. Reports claim that the chances of salvaging the medieval, Gothic monument are “not certain”. Claimed as an accident with no casualties, the public’s response to the event is emotional, widespread and insightful. The obvious answer to the question is the tragedy of losing something that has stood the test of time for centuries. Let us consider more deeply why the Notre-Dame was and is a global treasure and perhaps then we can understand the level of grief in the posts we scrolled by today. The Notre-Dame de Paris (The House of Our Lady) is not just a museum for tourist to peer into the past, it is a functioning house of God for millions of Catholics around the world. In the catholic church, different spiritual houses perform varying duties. A cathedral seats the Bishop, who is the leader of the diocese, making the Notre-Dame an important place of worship for Parisians. There were also options to attend mass at the cathedral, here is a sample schedule of the Sunday ceremonies in the Paris cathedral. Notre-Dame was built between 1163 and 1345, taking almost 200 years to built. It is said that it was to this cathedral that Napoleon invited Pope Pius VII to crown as emperor, but in the last minute took the crown and decided to crown himself. As they were building the Notre-Dame, there was a question how they would develop more drainage systems to match the size of the cathedral. Coupled with an inspiration of Egyptian carvings, the gargoyles were a perfect fit. The chimera were added in the 19th century and unlike the gargoyles are each unique. Thinking of the gargoyles, they literally come to life in our minds. In reality, stone creatures and Napoleon are not probably not the reason people in your news feeds are devastated by the loss. 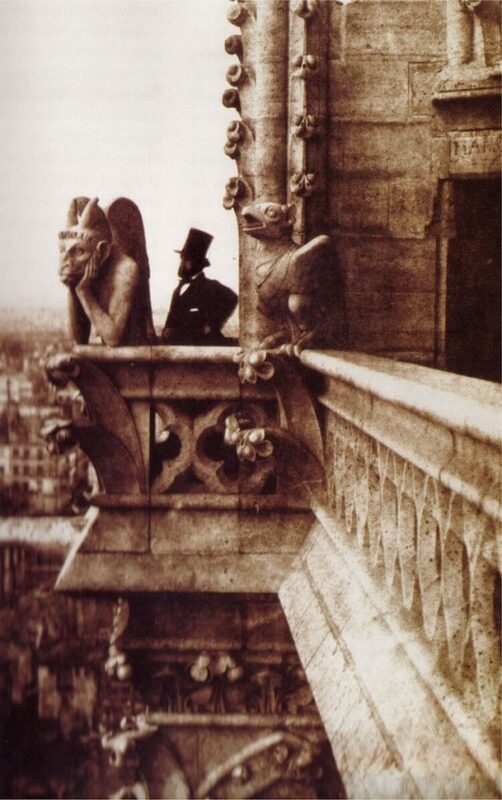 Many of us associate the Notre-Dame heavily with the animated classic, the Hunch-Back of Notre-Dame, written by Victor Hugo, French play write and preservationist in the 1800s. During this time, Parisians were bored with the Gothic aesthetic and thousands petitioned to destroy it. Hugo brought the cathedral to life to remind the public of the mystic and magic of the Notre-Dame. Many of us were introduced to the French monument through the eyes of Quasimodo and Anastasia. As children, we experienced the mystic of this piece of history, what felt like, first hand. When we see the tower of the Notre-Dame collapse in Paris 500 miles away, for some of us, it feels like it’s happening much closer to home. Paris is the most visited city in the world. The cathedral alone attracts 12 million people yearly. The capital of culture, romance and fashion, there are very few of us who do not associate this historical European city with class, beauty and wonder. The Eiffel Tower, the Moulin Rouge, the Louvre, the Champs Elysee, and the Notre-Dame cathedral are key elements of why a weekend break was never enough for us to absorb the level of enrichment this city has to offer. Throughout our lives, we have been bombarded with reminders of city’s cultural prevalence. We only know of all of these things through their heavy presence in our western media. In fact, here is a list of very well-known films to inspire your next trip to Paris. The Notre-Dame is more than just a cherished place of worship for Catholics, it is a familiar pillar of western cultural landscape. It was brought to life for the people living in 1831 by Victor Hugo and then again for us in 1996 by Walt Disney. The carving of Paris in our media as timeless hub of inspiration solidified the Notre-Dame in our minds as something eternal. Watching the images of something timeless crumbling and being reduced to smoke is an unsettling experience and arguably rocks the core of what we take for granted in the world and forces us to face the transient nature of even the most enduring constructs.